Last Friday the Original Sub Shop hosted a benefit for Toledo GROWs aptly named “Baghdad Cafe.” Toledo GROWs is the community gardening outreach program of Toledo Botanical Garden — and a really great cause! The dinner I shared with D. started off with a bunch of darling little bowls (handcrafted by Lisa David from now on to be known as L.D.) 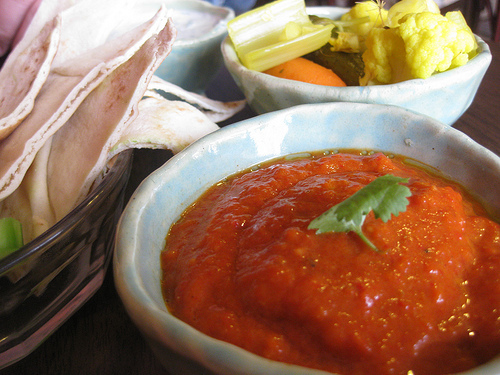 that were filled with the yummy richness of roasted red peppers, hummus, vegetables in an incredibly fresh tasting pickle, and an unknown-until-that-day carrot dip. 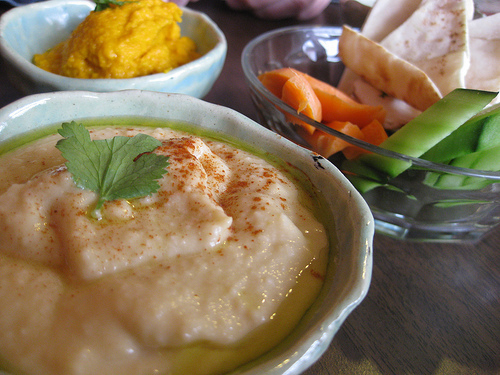 Have you ever had carrot dip? We joined in at the 5pm seating (there was the 5pm and a 7pm). 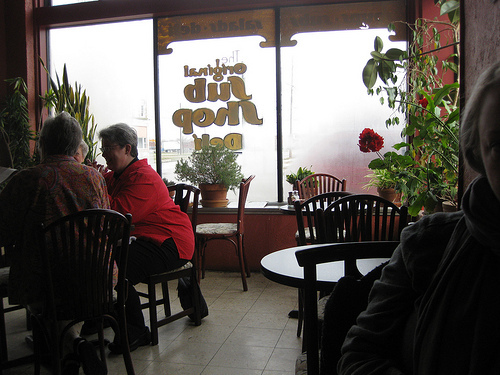 The windows were still fogged up… must have been all the great cooking that had been going on over the past day or two! We indulged on a choice of two soups. D. chose the yogurt-based option but I went straight fot the one that mentioned meatballs. 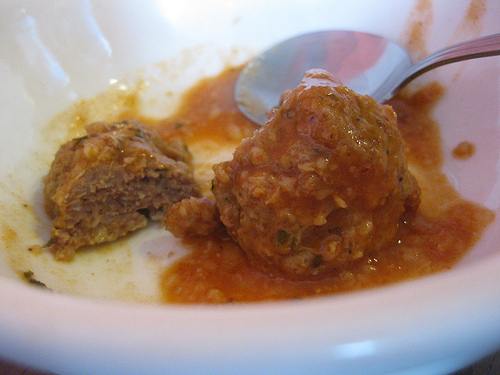 I was hoping to spare my tummy for the main courses so I only plated a couple of the meatballs. They were really fantastic. And then came the motherload of deelish. I shot D.’s plate because it was much more filled with stuff than mine–look at it!! !–I don’t know enough about the names of the cuisine, but there was some little rolls of meat, chicken (shwarma? 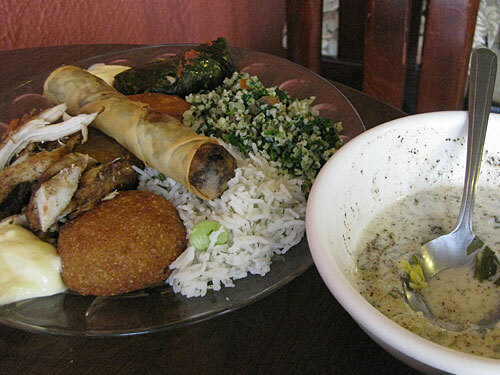 ), grape leaves, pastries filled with meats and cheese, barley salads, rices… it was bonkers. 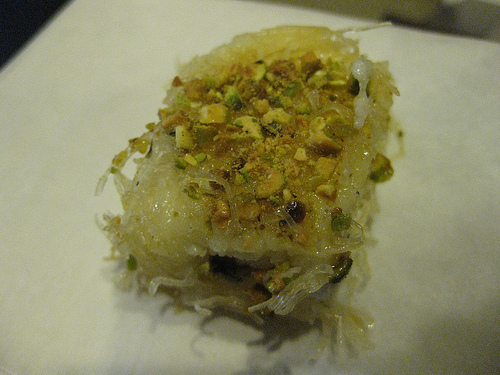 Now, I don’t remember the name but it was a custard encased in filo, drizzled in honey and nuts and amazingness. No… it wasn’t baklava. In my fantasy life I can host amazing cooks at my home to create important dinners whenever I like – and L.D. from the Original Sub Shop is at the top of my list. In my dreams… sigh. I am a huge fan of the Original Sub Shop and you should be as well!